Interview with Avatierre of the Juniper Forest, who brings poetry and visions of beauty about lullabies, butterflies, hummingbirds, fairy tales, waterfalls, rainbows, and shooting stars. He speaks of things that matter: kisses, kindness, compassion, truth, integrity, decency, honor, respect and patience. 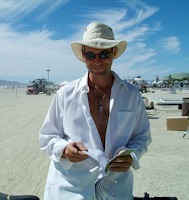 This episode is a blend of Avatierre's interview with BURNcast combined with a CD he had gifted out at Burning Man 2006. He states his whole naked soul lays bare on this CD and that he had only recorded it a few weeks before Burning Man. This episode of BURNcast is intended as a soundscape for friends who were unable to attend this year’s Burning Man. It’s like a postcard -- or rather a podcard -- featuring the sounds of the playa on Friday night before the burn. It’s simply a bike ride from 7:00 and Esplanade to 3:00 and Esplanade across the playa. You will hear Megavolt’s electric presence, the Neverwas Haul’s whistle, blasts from Burninator II and El Diablo thundering in the night. 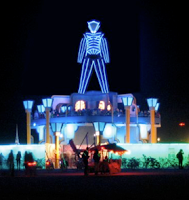 You also will hear the squeek of bicycles and overhear conversations as things begin to literally heat up on the playa that night.